Business and Professional women will celebrate Business Women Week with a mini-conference and luncheon on Oct. 1 in Frostburg State University's Lane Center. BPW has been applauding working women for over 50 years. During that time, there has been a dramatic "change" in the roles of women in the workplace. During the early celebrations of National Business Women's Week, nearly all honorees were in occupations typically held by females: teachers, nurses and secretaries. In the last decade or two, as educational and occupational stereotypes have begun to fade, there has been expansion of career choices. District court judges, telephone line repairmen, scientists for NASA, bank vice presidents, real estate company owners, insurance company owners, printers, funeral directors, university vice presidents, attorneys, among others, are women. The flood of women into the labor market has been called the single most outstanding phenomenon of the century. Eli Ginsberg, noted economist and chair of the National Commission for Manpower Policy, has said that "its long-term implications are absolutely unchartable. It will affect men, women and children, and the cumulative consequences will only be revealed in the 21st or 22nd centuries." The sheer numbers of women in the workforce is astounding. Over 42 million women are part of the labor force. They constitute more than two-fifths of all workers. The number of working mothers has increased more than tenfold since World War II, while the number of all working women has more than tripled. Members of the Cumberland Chapter of BPW will participate in the Better Possibility Workshops to be held at FSU's Lane Center on Saturday Oct. 1 from 9 a.m. to 3:30 p.m. Additional information may be obtained by calling 689-8297 (evenings). 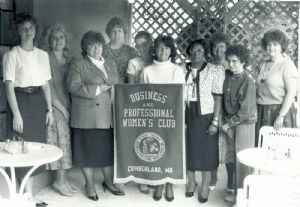 The Cumberland Business and Professional Women's Club (BPW) disbanded effective October 1, 2012.